An overwater bungalow resort might be among the dreamiest of honeymoon destinations. Here are a few that won't break the bank. 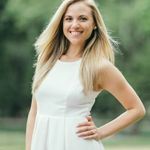 If your idea of the perfect honeymoon involves being perched atop pristine waters in one of the most amazing overwater bungalow resorts in the world, you’re probably trying to save up every single penny leftover from your wedding budget to cover the costs. Yes, this kind of honeymoon is on the pricier side given the luxurious nature of floating over the ocean in utter seclusion while being waited on hand and foot by a caring staff, but that’s not to say honeymoon huts are out of the cards if you’re not a Kardashian. In fact, there are plenty of overwater bungalow resorts that cater to honeymooners dealing with all sorts of budgets. 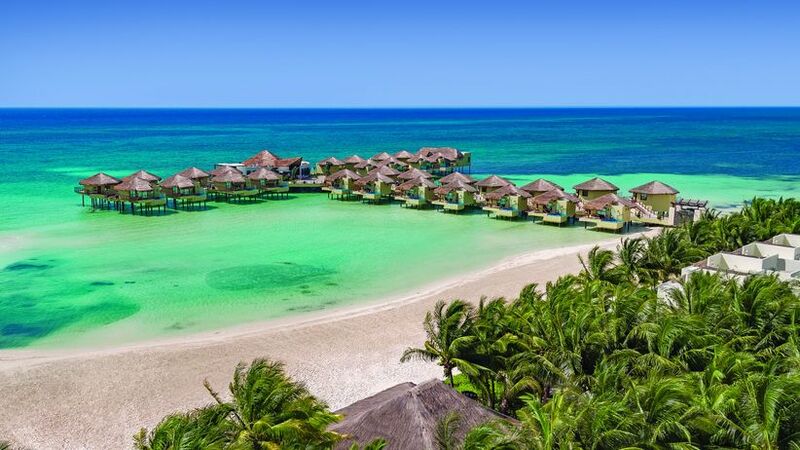 Here are some overwater bungalow resorts that top the list and offer cozy and romantic honeymoon huts at reasonable prices. Located in the volcanic cliffs of Negril, Jamaica’s Pristine Cove, this resort literally dangles over the azure Caribbean sea. If that’s not jaw-dropping enough, the honeymoon huts' rustic-chic decor made from local raw materials and stone, as well as their thatched roof will surely give you all the Jamaica honeymoon feels. Believe it or not, each individual villa sells for $250 a night during the fall season, featuring private wraparound balconies and open-air showers. Honeymooners are welcomed with a complimentary bottle of bubbly, scented candles and flower petals on the bed. Heralded as the first over-the-ocean suites in all of Mexico, this honeymoon hot spot consists of 30 elegant Palafitos, or elite overwater bungalows surrounded by the bright turquoise waters of Riviera Maya’s Maroma Beach. Each Palafitos features breathtaking views that can be leisurely admired while honeymooners are enjoying the spacious private infinity pools, glass-bottom floors, outdoor showers, direct ladder ocean access and an overwater restaurant and overwater spa on the premises. Although the rates start at $951 per person, per night, this includes all gourmet food, premium alcoholic beverages, 24-hour room service, a personal Majordomo to cater to each and every need, and much more, so pretty much all your other expenses are covered! When you first think of the central European country of Switzerland, you might picture snow-capped mountains, ski resorts and hiking trails, but there is one overwater bungalow resort. In fact, Hôtel Palafitte, set on lake Neuchatel, the largest lake in Switzerland, is the only hotel in Europe built on stilts. It was initially constructed as part of the National Expo in 2002, but the temporary hotel was so successful that the owners decided to keep the bungalows operational. There are breathtaking views surrounding each unit, with descending ladders from the room’s balconies directly into the lake. 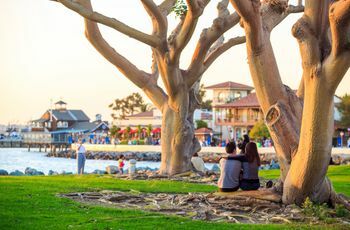 Honeymooners can enjoy water activities on the lake, direct access to hiking trails from the hotel grounds, biking, nearby chocolate houses, skiing breweries and wineries. If you’ve done any research on honeymoon resorts in the Maldives, a tiny tropical nation in the Indian Ocean, you know it’s hardly affordable. But this overwater bungalow resort offers rates that hover around $440 each night depending on your package. 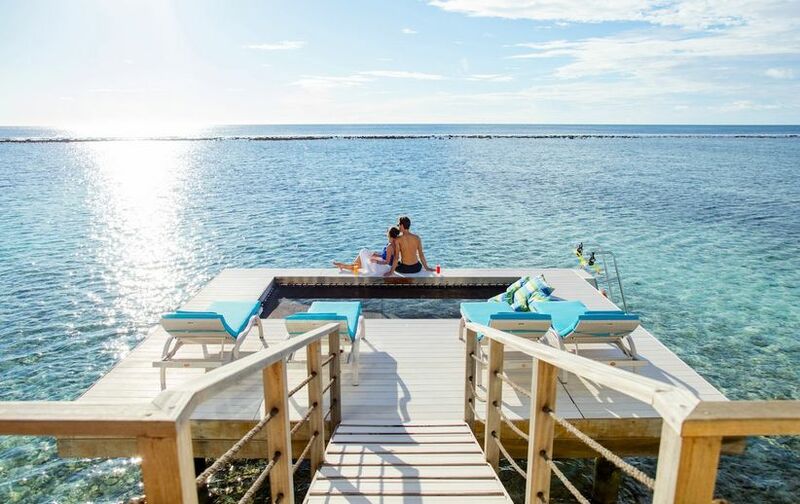 Each honeymoon hut comes with your own private deck looking out into the beautiful, crystal clear waters, outdoor shower and outdoor hot tub, as well as a cut-out portion of the deck that has netting similar to an overwater hammock. Adventurous couples will love that the resort offers a complimentary snorkeling tour in addition to many other activities like a dolphin cruise, turtle snorkeling, whale shark snorkeling and more. Put aside the image in your head of the traditional Mexican resort featuring high-rise, corridor or box-like buildings. You’ll, instead, find a more ethereal, authentic and raw-luxe honeymoon retreat at Playa del Carmen’s Mahekal Beach Resort. As you walk down their hand-laid, hidden stone pathways, you’ll find 196 private, palapa-style bungalows nestled comfortably between the dense jungle of the Riviera Maya and Playa del Carmen’s longest stretch of beach, spanning 920 feet. Ocean front “casitas,” or beach house bungalows are available directly on the beach featuring open-air terraces with crochet hammocks, personal plunge pools or private outdoor moon showers and rates starting at $350 a night. If you’re looking to celebrate your honeymoon surrounded by the clear-blue waters of the Caribbean, why not stay at one of the only two resorts to have pole housing toeing the shore. Each beach house is raised on stilts above the sand with two bedrooms, ensuite baths, full size kitchens, living rooms and private decks with pool, wraparound balustrade and a drop down staircase to the private beach below. Your daily view will be looking out to neighboring island St. Kitts! and have a drop down staircase to the private beach below. Fun added incentive: Nevis is speculated to be the royal honeymoon destination of Prince Harry and Meghan Markle! If you’re looking for a true island escape that will melt away all of the stresses of wedding planning, a French Polynesia honeymoon will offer you just that and more. The one problem with this popular honeymoon destination (which celebrities are known to frequent, might we add!) is that the majority of resorts are hardly affordable (unless you’re Nicole Kidman and Keith Urban who notoriously honeymooned there). That is, except for the Royal Huahine, which offers 18 garden bungalows, 11 beach bungalows and 11 overwater bungalows amongst stunningly gorgeous settings for a whopping $300 per night for two!